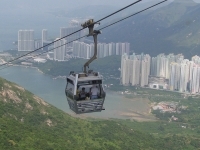 The Ngong Ping 360 Cable Car is a spectacular four-mile (6km) ropeway that affords panoramic views over the bay and surrounding area on its 25-minute journey to the Ngong Ping Village. As visitors approach the cable car terminal on top of the plateau views will include the huge Tian Tan Buddha Statue and the Po Lin Monastery. The Ngong Ping Village is situated right next to the cable car terminal, which features attractions such as 'Walking with Buddha', the 'Monkey's Tale Theatre', and the 'Ngong Ping Teahouse', as well as an assortment of shopping and dining options. Walking with Buddha plunges visitors into a multimedia presentation that follows the life of Siddhartha Gautama (the man who became Buddha) and his path to enlightenment, while the Teahouse provides demonstrations of traditional Chinese tea ceremonies. The Monkey's Tale Theatre presents a charming and comical show inspired by famous Buddhist Jataka stories that will enchant both old and young. The cable car is an incredible experience and there are a variety of packages to choose from. For instance, you can choose between the more expensive Crystal Cabin - which has a transparent floor - and a regular one. Note that queues for this attraction can get very long. Opening times: Monday to Friday 10am to 6pm, Weekends and Public Holidays 9am to 6.30pm. Admission: There are a variety of ticket options - check the official website listed above for details.